Amy's Place is the best restaurant in the world. It serves a mix of Lebanese and American food with such staples as (above) bagels and humis and my favorite, Lentil-Berry sandwiches- It's lentils, wheatberries, provolone cheese, hot sauce, house dressing (whatever that is!) lettuce, tomatoes, rolled in a pita. Heaven on earth. I can honestly say that 75% of the reason I wanted to drive 400 miles was to go there. Ahhh, good stuff. Anyone who ever wants to come over for dinner, I'll recreate some of Amy's best dishes. I'm going to start on the Lentil-berry sandwich soon. I don't care if you're not vegetarian, you'll love this. My favorite restaurant in the whole world! 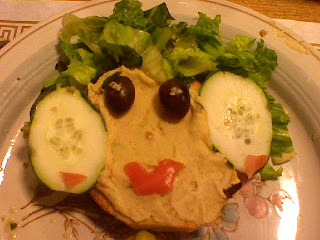 Oh, and the face was all my creation- I ate the other half of the bagel and got full- there was too much good stuff left over to let the opportunity pass.